The U.S. Capitol Building, pictured in Washington, D.C. on Tuesday. On Tuesday night, President Donald Trump plans to address the nation regarding the border. Following that speech, Democratic leadership will issue their response. VPR aired NPR's live coverage of these speeches Tuesday beginning at 9 p.m. The speeches come amid a partial government shutdown that's lasted more than two weeks. The stalemate continues as Trump demands funding for a wall along the Mexican border, which Democrats oppose. 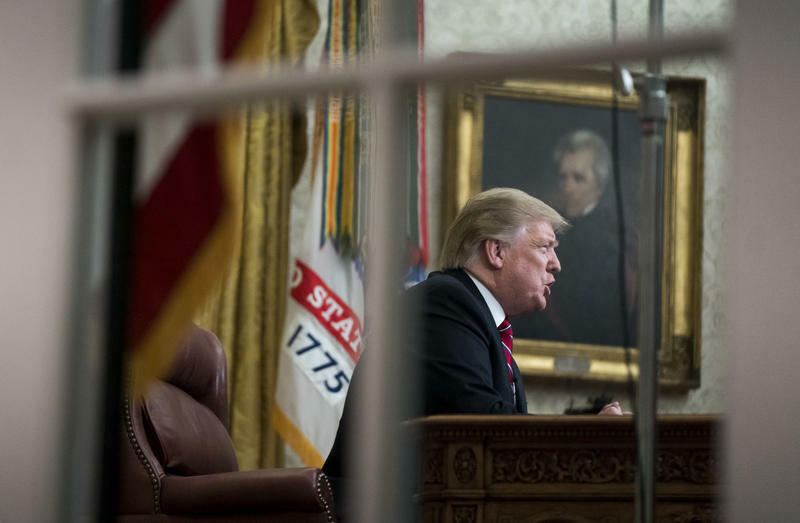 "7 Takeaways From President Trump's Oval Office Address"
"Trump Pushes For Wall Amid Shutdown, Says There's 'A Crisis Of The Heart' At Border"
"FACT CHECK: Trump's Oval Office Pitch For A Border Wall"
"Democrats Reject Trump's Wall Argument After Oval Office Address"
"FACT CHECK: Can Trump Use Emergency Powers To Build The Wall?" Sen. Bernie Sanders has also announced plans to livestream his own response to the president's speech following the address from Democratic leadership. Update: This post and headline were updated following the conclusion of the remarks.